The problems of creation of the Heat Protection System are considered. The paper presents a description of the Heat Protection structure and technology, history of its development, main properties of the Heat Protection materials and coatings, prevention methods from destruction and moisture. It shows possible application of the materials in another fields of the industry. Problems of creation of the lightweight Thermal Protection Structure (TPS) for the advanced Aerospace Systems are discussed. The success of many space programs depends on achievements in creation of the effective thermal heat protection system. The development of light high-temperature resistant protective constructions is the necessary stage of reusable space vehicles creation. The development of thermal protection (TPM) and constructional carbon-carbon materials (CCM) of reusable use that would not change their properties at repeated flights in space was one of the most difficult problems when creating BURAN orbiter. The application of so-called "hot" structure on the base of heat resistant metals with internal thermal insulation typical for supersonic aircrafts have encountered with design and material science difficulties coupled with large deformations and buckling of the construction by mechanical and chemical effects at operation temperatures of the orbiter and would result in unacceptable values of the structural weight. Tensile strength limit not less than 0,2 MPa. Materials on the basis of quartz fibers are the most satisfying to these conditions. The radiation and convective heat transfer through the pores and the material itself is maximally suppressed in them. Basing on the properties of a quartz fibers to weaken radiant heat exchange by scattering and by effect of multiple screening and also to reduce convective heat transfer, on the base of computational-experimental data on heat fluxes thermo-physical and mechanical requirements to the TPM were formulated. Structurally the thermal protection system (TPS) was made of separate tiles of TPM with outside glass coating of 0,3 mm thickness glued to the load-carrying structure with the help of elastic glue through the damping gasket [2, 3]. The tile was hydrophobed and on its external coating the additional lacquer film was applied for protection against atmospheric precipitates. The external coating on the lateral surfaces did not reach the bottom face forming ‘respiratory’ area. Through it there was the pressure equalization inside the tile to the environment at the orbiter ascent and descent that eliminated the appearance of additional loads on TPS element. The elements were fixed on the surface the orbiter with the gaps. The value of the gap was determined from a condition of deformation difference compensation of the load-carrying structure and the TPS element both at temperature influence and at static and dynamic loads. Depending on the size and kind of the gaps and also their arrangement on the surface they were filled by brush type inter tile seals, canvases made of quartz fibers, twisted and brush seals. The orbiter TPS consisted almost of 38800 separate elements distinguishing on the shape and in the plan on curvature of the outside and internal surfaces, angle of inclination and kind of lateral surfaces, external coating, presence of cut-outs, undercuts etc. At manufacturing of the elements some modifications of materials were used. For a smooth streamlining it is necessary that the steps between separate tiles did not exceed several tenth shares of a millimeter. To receive necessary gaps and steps it was required very precisely not only to manufacture the block itself but also to make its mounting that was provided by hard fulfillment of parameters of technological process. The mechanical treatment of the tiles was conducted to within 0,5 mm accuracy on the milling machine tools with program control of the diamond instrument designed particularly for the given process. The experimental researches revealed boundary conditions on the permissible waviness of the metal surface under TPS coating that guaranteed safety at exploitation. Besides, with the use of the technological methods the problem of surface quality assurance at sticking or protruding of fastening elements was solved. For more exact adjoining of every tile to the curvilinear construction surface the program of processing was corrected by the results of measurements of the real assembly surface more than in 100 points under every tile with the help of the special device under the personal for each element program. All processes including development of the design documentation, technology of manufacturing and control were conducted on the computer with the use of software designed for these processes. Besides the every-operation control of all technological process of tiles manufacturing and mounting, used materials, semi-finished products, every tile after its mounting passed the final control by applying of specified tearing off load. The main efforts were concentrated on the initial stage on creation of thermal protection material from quartz fibers and manufacturing of quartz fibers of definite diameter (2 microns) was also a difficult engineering problem. The development of the technology, organization of manufacture of quartz fibers from domestic raw material and TPM on their base was done by domestic institutes and enterprises. For giving the TPM high stability for cycle heat loads it was necessary to use initial raw material such as vein quartz in which the content of structural and mineral impurities would be minimum (and especially alkaline and alkaline-earth), and the presence of silicon dioxide was not less than 99,9% that could provide stability to a crystallization of initially amorphous silicon oxide and predetermined the stability of finished material properties at exploitation. For TPM creation that meet the requirements of BURAN exploitation, it was required for the first time to develop the technology of obtaining low disperse stapled quartz fibers of diameter 1 … 2 microns. Proceeding from loads estimation that are operational on the orbiter TPS the requirements to TPM on tensile strength were formulated at level of 0,2 MPa. According to domestic institutes estimations the value of operational tear off load on the TPS surface reached 0,02 - 0,025 MPa. At the same time ‘tearing off’ inertial loads up to 150 units acted on the TPS made by oscillations of the construction panels that resulted in tearing off pressure on the thermal protection place of connection with the construction about 0,02 MPa. The local sags of the construction surface under loading also concern to the major factors of TPS tear off loading. In view of high brittleness of quartz TPM even the minor sag of the metallic substrate would call separation or destruction of the tiles. In order to prevent it and also for compensation difference of thermal expansion coefficient difference TPM elements were glued to the metal via the damper (felt substrate) lowering this load. Nevertheless, at 0,2 mm sag on length of the TPS element (150 mm) separation stresses have appeared (~ 0,02MPa). Besides, the adjustment inaccuracy to the metal of TPS elements caused residual stresses in the substrate and the element itself (0,02-0,03 MPa). Practically, incongruities of the TPS element and the metal surfaces could reach 0,5 mm. All these loads could act both separately and together, that is why the whole value of tear off stress reached 0,08 MPa. Proceeding from the above-stated requirements, there were developed and later mastered by the industry the two types of high-temperature resistant TPM materials: TZMK-10 and TZMK-25 (Table 1). When TPM developing to the initial components were demanded requirements not only on the minimum contents of impurity but also on their compatibility with amorphous quartz . At mixing of quartz fibers with binding, it concentrated mainly in the area of a fiber contact and after subsequent heat treatment the spatial framework was shaped the volume of which consisted more than on 90% of pores. As a result the unique technique was developed and the criteria of the technological process parameters estimation providing obtaining of TPM different types with stable properties was determined. Each stage of a technological process of TPM obtaining was inspected. At the stage of the final inspection the TPM unit passed 100% X-ray inspections on presence of extraneous inclusions and non-uniformity of density. The strength of each block was also evaluated. As it is seen from Table 1, the TZMK-10 material surpasses foreign analog Li-900 on tensile strength, and TZMK-25 is easier than Li-2200 on 30 % that is very essential for space objects. In BURAN TPS the materials on the base of quartz and siliceous fibers were used. The further increase of the operation temperature of similar materials requires replacement of fibers SiO2 on more refractory AL2O3, ZrO2, SiC, Si3N4 (Figure 1). Activities in this perspective direction for future aerospace systems NPO MOLNIYA conducted together with VIAM. protection of hygroscopic TPM from water and moisture penetration. On available experience of experimental development the erosion resistant coating successfully solved the first two problems and only partially the third one . It is difficult to protect TPS tile from penetration of moisture as at even minor mechanical effects the cracks were formed in the coating. That is why TPS protection from water and moisture was ensured with other ways. The problems of external coating resistance increase to the cracks formation were simultaneously solved. During TPS tiles development and manufacture the external coating was continuously improved. Now two marks of coating are being applied: ‘black’ EVCH-4M1Y-3 and EVCH-6 having high emissivity and protect the lower part of the airframe at descent from the greatest thermal loads; ‘white’ - EVS-6 limits in orbital flight temperature of heating from solar radiation of the top of the airframe. The coatings have sufficient resistance to cracks appearing. 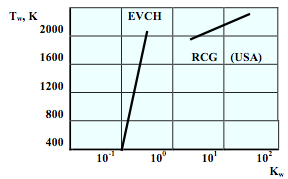 The following erosion resistant coatings are of great interest: EVCH and EVS for TPS tiles (Figure 2), EVGS for the flexible TPS, VRCH and VRS for quick repair and operational maintenance of the damaged TPS elements without their removal from the orbiter. The further modification of the coating appeared less prospective as its resistance to cracks appearance under mechanical loads is determined not only by the strength of the coating but also by the rigidity of the substrate. More shock-resistant coatings were recently developed. However at presence of the cracks they did not protect the TPM from moisture and unprotected TPM could absorb up to 500-700% of water on its weight. Activities on hydrophobic composition creation for the TZMK-10 materials and development of protective lacquer films on external erosion resistant coating for healing the cracks and protection against atmospheric precipitation therefore were conducted. For maintenance of hydrophobic effect TPM tile was treated by the solution of silicone polymer. Hydrophobization was done at TPS manufacturing and burned out at the first descent of the orbiter from orbit in the areas where temperature of the coating exceeded 450°C. Besides, on elements of large thickness hydrophobization of all volume was not provided, as the external layers close to the external coating could absorb moisture. It would result not only in uncontrollable increase of the weight but also could cause destruction of the coating surface after injection into the orbit owing to intensive evaporation of moisture. Originally there was developed water protection as a lacquer film on the base of different polymers (for ‘black’ and ‘white’ coatings) sprayed on the external and the lateral surfaces of the tiles. As the tests showed and the exploitation on the ground the coating provides TPS water protection. The deposition of the coatings into the gaps between the tiles is difficult for inspecting that reduces reliability of lateral areas water protection, and the coating itself is for only one use, i.e. requires repeated applying after each flight. At the same time, due to electric conduction of lacquer coating the removal of static electricity from the surface was reached. The second stage was the solution of volumetric hydrophobization problem between flights that provided protection from water absorption of all tiles. Most effective for this purpose was silicone composition – hexamethyldisilazan. Its insertion into TPM volume resulted in a practically uniform distribution on the surface of fibers and ensured hydrophobic properties of the material in all the tile volume. Hydrophobic properties were saved at the exploitation in ground conditions after thermal ageing on air at 80°C within 30 hours. Repeated hydrophobization is technological one and can be carried out by different methods: by gas phase way, diffusive saturation and also by injection. The simplest methods of hydrophobization are the diffusive saturation and gas phase way as they do not require technological equipment and do not result in additional damage of erosion resistant coating as at the injection method. At diffusive saturation the pairs of hexamethyldisilazan were entered into the internal volume of the tile by gasphase diffusion through the non coated lateral surface of the tile. For 100% hydrophobization of the tile (100 cm3) the insertion of (160 cm3) hydrophobic composition is necessary from the two opposite edges of tile with duration of process 24 hours. As it was already mentioned the attachment of the elements to the skin is implemened through the damping substrate - felt. As the basic material for the substrate the combinations of heat-resistant organic stapled fibers (mark of the finished material is ATM-15PK) were used. With the purpose of ensuring water-repellent properties, the damping substrate (felt) subjected hydrophobic processing by the composition on the base of silicon-organic emulsion and subsequent calibration at 200°C temperature. For maintenance of airframe skin permissible temperature in the gaps between TPS elements the inserts were installed made of multilayer felt material on the base of heat-resistant organic fibers. On their external surface after hydrophobization and calibration was applied erosion resistant water protection coating of silicone polymer that provided to the finished insert (ATM-16PKP) serviceability at operational temperature up to 430°C in conditions of unilateral heating. In areas of the airframe where temperature did not exceed 370°C, the flexible thermal protection coating (ATM-19PKP) was used. It was made multilayer from heat-resistant organic fibers on needle punching machines. ATM-19PKP water protection properties were provided by the same way as on ATM-15PKP material. The activities on perspective flexible TPS for future aerospace systems made of specially sewed blankets with the external coating of fabric are directed on perfecting of their production technology (Figure 3). For attachment of the layers of TPS coating among themselves (tile + felt) and the whole TPS element to the skin (felt + skin) there was used designed glue sealant of cold solidification ELASTOSIL 137-175M on the base of modified silicone rubber. It ensured reliable connection of the TPS layers among themselves and with the skin of airframe in the temperature range from -130 to +300°C. In order to prevent penetration of the heat flux between the TPS elements and also in joints areas with varied gaps while in service, the flexible thermal seals of three types were applied: braid type, brush type and inter-tile padding. In turn, the each type included several kinds of seals. Brush type high-nap seals (VVU) were mainly used in zones of installation of the cargo bay doors, brush type low-nap seals (NVU) - in movable units of the vertical tail, balance flap, elevon. Braid type seals such as SHTKV-10 and SHTKV-20 on the base of quartz filaments with the sleeving of continuous quartz threads were used for sealing of gaps in installation sites of the doors and hatches of different assignment. Braid type seals SHTKV-15 on the base of thread type crystals of silicon carbide with the sleeving of continuous inorganic threads were used in most heated areas, in particular for the seal of the gap of the joint between separate carbon-carbon sections of the wing leading-edge and also in the area of the joint of the carbon-carbon units with TPS elements. The gaps between some most heated TPS elements were filled by the special canvas of quartz fibers  and developed technology allowed to make repair of the damaged parts of the seal by their removal and replacement on new ones. When the gaps between TPS elements were more than 5 mm there were used inter-tile thermal seals (MTU) made of inorganic fibers. From 38800 TPS elements approximately 28000 were simple trapezium type in the plan but had, as a rule, complicated surfaces on their contour - external theoretical and internal close surface of double curvature. Unlike Space Shuttle orbiter on some units of the BURAN orbiter there was applied fan type cutting that allowed to avoid triangular and sharply angular tiles of low strength. In the most heated area (the lower part of the wing and fuselage) direction of the tile belts i.e. the longitudinal gaps ‘traced’ the orthogonal direction to the local streamlines that allowed to avoid overheating in the longitudinal gaps, to increase the duration of the laminar flow regime and to reduce heat fluxes in the boundary layer. The tiles of size in plane from 150×150 mm up to 200×200 mm were installed with 0,5-5,0 mm gaps with hard tolerance. Approximately 6000 tiles were ‘non-regular’, i.e. of polygonal form in plane and formed complex ‘patterns’ on the hatches, around the nozzles of the engines, on the edges of the aggregates. Approximately 4800 tiles of the complex shape had grooves, recesses appearing edges for formation of locking connections on the hatch edges, on the edges and joints of different units, in the area of movable connections. About 200 blocks concerned to especially complex ones and were made by a nonstandard way. For every block automatically there was made technological appliance – lodgement (for basing at the final mechanical treatment of the surface adjacent to the airframe skin), profile appliance – the sucker (for tear off tests) and also the tile of the damping substrate. Thus, for one the airframe automatically without the drawings there were made more than one hundred thousand shape-forming details. For these details automatically there were generated at the production plant more than 800000 individual computer programs of processing, control of the shape, sectoring, marking, cutting and measurement of ‘tile nests’. For the most heated areas of the construction (the nose fairing of the fuselage, the wing leading-edges) there was developed and applied the heat resisting composite material ‘carbon-carbon’ of two versions: GRAVIMOL and GRAVIMOL-B (Table 2). The nose fairing of the fuselage was manufactured of GRAVIMOL material. GRAVIMOL-B was used for manufacturing of the wing leading-edge . The materials are similar on the technique of manufacturing and differed only with the filling woven material [for the nose cone (hemispherical detail) more thin filling material TKK-2 and for details of the wing leading edge TNU-4 filling material]. The attachment of CCM aggregates was made by thrusts from heat resisting alloys with the system of protective coatings. The carbon fabrics and modified phenolic resins subjected to pyrolysis during high-temperature treatment were used for CCM manufacturing. Later the semi finished CCM item passed processes of pyrolytic densification and boron siliconizing. On the external surface of the units from CCM there was applied external antioxidating coating on the base of molybdenum disilicide. For prevention of heat propagation from the most heated CCM aggregates to the ‘cold’ primary structure and also for compensation of CCM temperature expansion, the cut-off bridges from constructional nitride ceramics were applied that were installed in attachment units of carbon - carbon aggregates. For prevention of contact heat transfer the units from CCM were isolated from TPS tiles by the guaranteed gap filled with thermal seal on the base of filament type silicon carbide crystals (for blocking of the radiant heat flux). Designed for the orbiter TPS materials began recently to find their use in other areas of science and engineering. Having high cyclical resistance to the thermal loads, TPM on the base of quartz fibers are successfully used in heating furnaces of different class and assignment. Besides, these materials are considered as effective filters and the question of their application in the units of artificial blood circulation is being studied. The technique and the equipment for their manufacture can be widely used in manufacture of different heat-sound insulation materials for housing construction and also as biologically proof and non-flammable isolation for refrigerating chambers and different storehouses. Having the unique ability to save the properties both at high and low temperatures, the designed materials can be successfully applied in different objects of the Far North of our country. The large future belongs to the composite materials that are biologically compatible with human organism and can be applied as high-performance orthopedic and bonding materials. The activities on creation of new generation TPS materials that surpass existing on temperature of exploitation are finished; besides they have smaller density while they save the other properties. 1. BURAN orbiter TPS coating creation ensured protection of its airfoil against the high-temperature airflow effect. The TPS coating provided the successful flight and showed the efficiency for reusable transport spaceships. 2. The experience of the orbiter TPS creation showed the correctness of the selected paths of thermal protection materials and constructions development and will be doubtlessly used in the future when developing the perspective aerospace transport systems. 3. The materials obtained while the development, the technique and the technologies can find broad application in many branches of the national economy; however, now some interesting solutions are used in insufficient scales. The work was done step-by-step. At the very first stage the employees of materials technology department (headed by Mr. Goryachkovsky U.G.) on the base of the designers technical requirements and calculations made under the direction of the department chief (Dr. Gofin M.Ya.) and also requirements of aerodynamic and thermodynamic specialists under the management of the deputy chief designer (Mr. Voinov L.P.) and (Dr. Timoshenko V.P.) developed technical requirements with determining parameters of the TPS material. The main circle of the organizations - initiators and co-developers - was determined. The main developers of the given problem were the leading Research Institutes of the branch and the number of organizations of the country. The main organizations were VIAM, NPO STEKLOPLASTIC, ONPO TECHNOLOGIYA and others. In VIAM the development of fibrous ceramics was conducted by the experts of the laboratory headed by Mr. Gribkov V.N. and the development of quartz fiber was done by the experts of NPO STEKLOPLASTIC under the technical management of Mrs. Aslanova M.S. and later under the management of her successor Mr. Hazanov V.E. Then, proceeding from the requirements of the reliability ensuring program developed by Department of Dr. Gofin M.Ya., by same department were submitted the complex programs of experimental development of TPS (1st stage – the stage of materials development; 2nd stages – the stage of material development together with construction). In process of advancement of the development, TPM operating characteristics were checked up and corrected. Continuously there was material perfecting. By 1980 the TZMK-10 material meeting the requirements of the task had been obtained. At the same time ordered purposeful activities on creation of erosion resistant coating for fibrous high-porous quartz ceramics were done. In VIAM this activity was conducted by the specialists headed by Dr. Solntsev S.S, in NPO MOLNIYA by Mr. Prilepsky V.N. and Mrs. Eremina A.I. The problem of erosion resistant coating content and deposition technique creation was put before other organizations such as the Leningrad institute of technology, All-Union institute of refractory products, Institute of silicate chemistry, Perm polytechnic institute and others but their success was more modest. In 1982 the structures and the technique of deposition of erosion resistant coatings of EDU and EVS marks were developed. The estimation tests for conformity of the requirement specification on materials confirmed their serviceability; further began to gain momentum the complex programs of material tests together with construction. Large volume of such tests was done by NPO MOLNIYA, TsAGI, TSNIIMACH, IVTAN and others. The problems of TPM hydrophobization, its reliable attachment to the airframe skin were solved; the flexible thermal isolation was developed on the base of organic fibers. The experts of different organizations joined by the common task worked hand in hand, all their knowledge and efforts were directed on the solution of difficult technological problems that they successfully solved. The co-developer of this important technical direction became NPO HIMVOLOKNO (Mytischi). The final concept of the material and the configuration as a whole was defined not at once. Till 1978 there was forecasted CCM of KUPVM-BS type having the good complex of strength and heat resisting properties. But it became obvious that at existing technological capabilities the fairing as a whole cannot be done from this material and the questions of qualitative connection of separate fragments appeared rather problematic. As a result it was necessary to refuse KUPVM-BS material and the concept of GRAVIMOL material was adopted. The working processes on technological conversion were completed at the Moscow electrode plant. The soul and the conductor of all the development was Mr. Konokotin V.V. who with the workers of the plant lead up to perfection all the operations of fairings manufacturing multistage process beginning from the process of woven packages assembly: impregnation by resins, multistage high-temperature treatment, siliconizing and the final adjustment of the details on the machine tool. At the stage of manufacturing of the details set with spare parts from the GRAVIMOL material, the Deputy Chief Designer Mr. Mordovin S.G. headed the design and technical management. It is necessary to say about two days of quality every week (Thursdays on Moscow Electrode Plant (MEZ), Tuesdays on Tushino Machine Plant (TMZ)) of leading experts of VIAM, NII GRAPHIT, NPO MOLNIYA, MEZ, TMZ where the difficult technical problems were operatively solved, the measures for debugging of failures and defects that always were present at the manufacture at the stage of difficult technological processes introduction. The experts joined by the common problem worked hand in hand, with huge enthusiasm. 1. Aslanova M.S. Glass fibers. - Moscow, HIMIYA, 1979. 2. Kondrashov E.K., Vladimirsky V.N., Beider E.Ya. Erosion resistant paint coatings. - M. HIMIYA, 1989. 3. Solntsev S.S. Protective technological coatings and refractory enamels. - Moscow, MACHINOSTROENIYE, 1984. 4. Petrova A.P. Heat-resistant glues. Moscow, HIMIYA, 1977. 5. Gorshkov V.S., Timashev V.V., Saveliev V.G. The methods of physic-chemical analysis of binding substances. - Moscow, Higher School, 1981. 6. Thermal protection of transport spacecrafts (review) // The technological collection ‘The equipment, materials, technique and furnishing units’. - Moscow, 1977. - 53-77 pp. 7. Materials and production technology of airspace transport systems // The collection of the first International Airspace conference works. Volume 5: materials and production technologies of airspace transport systems. - Moscow, RIA, 1995. - 4-22, 315-326 pp.